We have so much cilantro growing and the plants are beginning to bolt so I cut a lot of it today and made a big bowl of pesto from it. The good thing about cooking with cilantro is that the stems have the same taste as the leaves, so when you have a lot, you don't have to worry about pulling off all the leaves from the stems - just use the whole lot. I made up my own pesto recipe, using walnuts, cilantro, olive oil, a little lemon juice and some water. Gosh it tastes so vibrant. The way I eat it most is as a dip or spread for crackers. When you make a large quantity as I have, you can freeze it in little muffin molds then pull one or two out as you need. Phew - after reading all that, I should be planting some more so the next batch is ready in a few weeks! 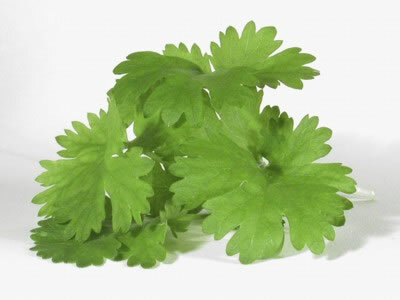 What's your favorite recipe for cilantro (or coriander as we call it in England)? Wow! I never knew! We also had a 1/2 a bed full of bolting cilantro and I just composted it! Thank you for the new knowledge and yummy recipe! Hope you enjoy the recipe. I'm still working through mine! think I made rather too much!